Health Ranger: Alright, welcome to the Health Ranger Report, this is Mike Adams with NaturalNews.com. Today we're bringing you some disturbing footage of a teenage boy being quote 'treated' with electroshock therapy at the Judge Rotenberg Center. This is a center for, well, quote 'treating children' with behavioral disorders. Now, many people in America don't realize that electroshock therapy is still being used in America today. It is, it's part of the psychiatric industry. They don't only deal and push their drugs onto children, they also torture children. What you're about to see is film that has been covered up by this center for eight years, and it was only recently that a judge allowed this film to be released so that we can see the truth of how children are tortured. In this case, this teenage boy was shocked, what, 31 times over a period of seven hours while he was strapped down. Basically, this is a torture chamber that you're about to see. They put a helmet on his head. You can hear him screaming, 'help me, help me,' screaming in pain. And all these people, these, what do you call them? These pathetic loser human beings, these evil miscreants are just standing there. And no one's helping him, the guy's shocking him. This is the new America, alright? This is what we used to see in Russian Gulags for example, or maybe in North Korea. Now it's in America, and it has been for a long time. This is something that you normally won't see on the news. In this case, Fox News covered this, but most other news organizations didn't pay any attention to it because they don't want to show you what's really happening in America, where torture is alive and well. Take a look at this clip and then share this so that others can know the truth about what's happening in America today to our children. Take a look. Fox Newscaster Mark Ockerbloom: Screams of pain from a student at the Judge Rotenberg Center as he's tied down and shocked for hours. Good evening, I'm Mark Ockerbloom. Maria Stephanos: I'm Maria Stephanos. Fox Undercover's camera, the only one in court today as a jury is given its first look at that disturbing video. Our investigative reporter Mike Beaudet in that court today. He's here now to give us the latest. What do you have, Mike? Mike Beaudet: Maria, this is the video that the Judge Rotenberg Center in Canton has fought long and hard to keep from the public eye. The center convinced a judge eight years ago to seal it, and the battle continued right up until it was played in court as lawyers for the center asked the judge to bar our camera from recording it. 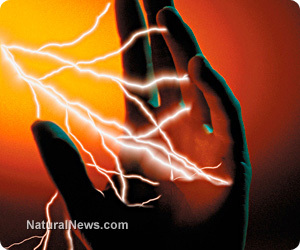 Well the judge said no, and now for the first time ever, the public can see for itself what these controversial electric shocks look like in use. Dramatic video of New York teenager Andre McCollins, restrained face down, a helmet on his head, screaming for help. The Judge Rotenberg Center calls it treatment. Attorney:That was shock number 16 or 17 out of 31 that day. Mike Beaudet: As McCollins' attorney just described, the teenager was shocked 31 times in all that day in 2002. McCollins is suing the Canton-based center, calling it torture. Lawyers for the center and its clinician say McCollins needed aversive therapy because he was aggressive. Attorney 2, Edward Hinchey : These are dramatic tapes, there's no question about that. But the treatment plan that the Judge Rotenberg Center, the treatment plan that Andre had in place on October 25 was followed. Mike Beaudet: It was an emotional day for McCollins' mother, Cheryl, who was in court as video was played from the beginning of Andre's ordeal, when he was shocked and restrained after refusing to take off his coat. Cheryl: I never signed up for him to be tortured, terrorized, and abused. I had no idea, no idea, that they tortured the children in the school. Mike Beaudet: Cheryl testified what her son was when she visited him three days later. Cheryl: I couldn't turn Andre's head to the left, to the right. He was just staring straight. I took my hands and I went like this, he didn't blink. Mike Beaudet: Now, Cheryl McCollins did get Andre to children's hospital that day where he was diagnosed with Acute Stress Response caused by the shocks. We should see more of that video Wednesday in court as Cheryl McCollins returns to the witness stand. Maria. Maria Stephanos: Mike, I gotta tell ya, that was some tough video to watch. What was it like in the court room? Mike Beaudet: Well, it certainly seemed like it got the jury's attention, and the defense obviously knows that video is disturbing to look at. It certainly did not help the defense case when Cheryl McCollins testified about watching the video and hearing staff members laughing, laughing, that's right, while her son was on the floor. Maria Stephanos: Mike Beaudet, alright, thank you, Mike.